With stories from the front lines, a legal scholar journeys through distinct legal climates to understand precisely why and how the war over abortion is being fought. Drawing on her years of research in El Salvador—one of the few countries to ban abortion without exception—legal scholar Michelle Oberman explores what happens when abortion is a crime. Oberman reveals the practical challenges raised by a thriving black market in abortion drugs, as well as the legal challenges to law enforcement. She describes a system in which doctors and lawyers collaborate in order to identify and prosecute those suspected of abortion-related crimes, and the troubling results of such collaboration: mistaken diagnoses, selective enforcement, and wrongful convictions. Equipped with this understanding, Oberman turns her attention to the United States, where the battle over abortion is fought almost exclusively in legislatures and courtrooms. Beginning in Oklahoma, one of the most pro-life states, and through interviews with current and former legislators and activists, she shows how Americans voice their moral opposition to abortion by supporting laws that would restrict it. In this America, the law is more a symbol than a plan. Oberman challenges this vision of the law by considering the practical impact of legislation and policies governing both motherhood and abortion. Using stories gathered from crisis pregnancy centers and abortion clinics, she unmasks the ways in which the law already shapes women’s responses to unplanned pregnancy, generating incentives or penalties, nudging pregnant women in one direction or another. In an era in which every election cycle features a pitched battle over abortion’s legality, Oberman uses her research to expose the limited ways in which making abortion a crime matters. Her insight into the practical consequences that will ensue if states are permitted to criminalize abortion calls attention to the naïve and misguided nature of contemporary struggles over abortion’s legality. 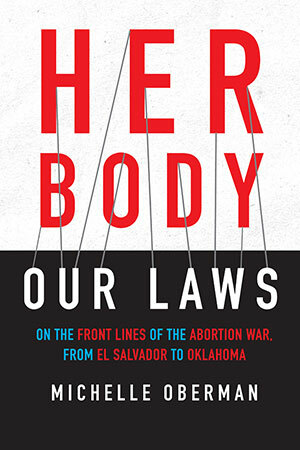 A fresh look at the battle over abortion law, Her Body, Our Laws is an invitation to those on all sides of the issue to move beyond the incomplete discourse about legality by understanding how the law actually matters.